The committee’s ranking Democrat, Sen. Tom Carper of Delaware, stressed to Nason the need for the administration to work with Congress on identifying an ideal source of funding. The senator also reminded everyone about the urgency of the matter. The current FAST Act highway authorizing law expires in the fall of 2020, and analysts project the Highway Trust Fund account will be insolvent soon after that. The account relies on revenue from the 24.4-cents-per-gallon diesel tax, and 18.4-cents-per-gallon gas tax, both of which have remained unchanged since the start of the Clinton administration. While Congress over the years has not approved one sustainable source of funding for the maintenance and construction of the country’s transportation network, more than half of the states have opted to increase fuel taxes to pay for repairs and modifications to their highways and bridges. Last year, the Republican-led House and Senate chose not to consider Trump’s 10-year, $1.5 trillion private sector-centric infrastructure plan. Transportation Secretary Elaine Chao has emphasized before Congress several times that the administration is taking an all-options-on-the-table approach to highway funding. Besides funding, Carper said the climate is changing, and the transportation agencies should fund projects that would be resilient to extreme weather. “Our vehicles and travel patterns accelerate and exacerbate that change, while at the same time, increasingly extreme weather events and sea level rise wear down our transportation networks,” Carper explained. “For those of us that have coastal infrastructure and that are coastal states, to have a federal highway administrator who will pay attention to real facts and real science is a matter of importance,” added Rhode Island Democratic Sen. Sheldon Whitehouse. Nason pledged to work with lawmakers on their myriad concerns. Trump has been dismissive of reports linking human activity with changes to the world’s climate. The Republicans on the panel praised Nason on her record at the National Highway Traffic Safety Administration, which she oversaw for a few years during the George W. Bush administration. The committee has yet to schedule a vote on Nason’s nomination. The administrator role at FHWA is vacant and the agency’s top officer is deputy Administrator Brandye Hendrickson. 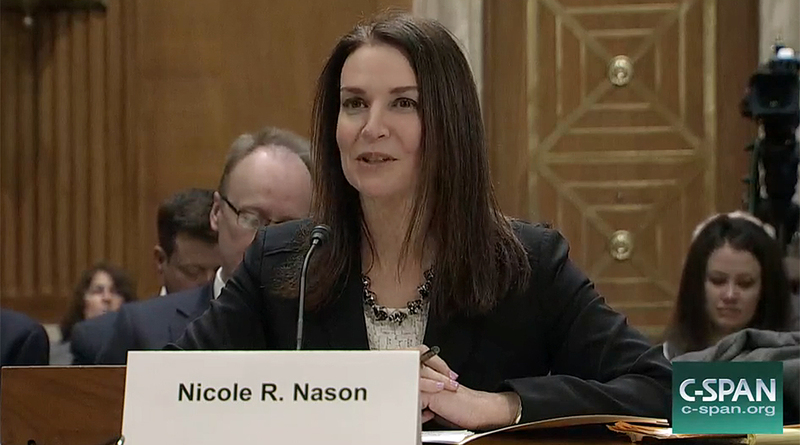 Most recently at the State Department, Nason helped develop seat belt rules for school buses, and the rulemaking for electronic stability control systems. During her time at DOT, she was chief attorney for former Transportation Secretary Norman Mineta, and she was an assistant commissioner at the U.S. Customs and Border Protection.